When anxiety controls your life, it feels like you have no say in what is happening, or the outcome. Here’s what you can do to slow the chaos and get back in charge. Today I’m talking to you about how you can get your life back from anxiety and I know how difficult it is when anxiety controls your life. It feels like no matter what you think or do or say, anxiety is there at every turn. It feels like anxiety is in control of you rather than you being in control of your own life. So today I would like to talk to you about how you can take that back and feel like you’re back in the driver’s seat of your life again. And like always, there’s a simple 3-step process that it takes to regain the control of your life from anxiety. This is a little bit of a paradox, because step 1 is to really understand that the idea of control is an illusion. Now, let me explain that a little bit for you. We are incarnated into a human body, but we are spiritual beings. We are here to grow and to be the most fulfilled expression of ourselves on this earth plane that we’re on here now. In order for the universe to work, it exists within us and outside of us and we have the ability to think, we have the ability without thoughts to put signals out to the universe. The way that the earth plane is brought to us is that the signals echo back at us. So, what this means is, when anxiety controls your life, when you’re feeling off, when you’re feeling off kilter or out of alignment, then your signal is also going to be off. So your signal goes out to the universe and then gets echoed back to you again in a really chaotic way. So that’s why sometimes you can feel like you’re on a bit of a negative roll. One thing goes wrong and then another thing goes wrong and then another thing goes wrong and that is because you’re kind of bouncing around in an echo chamber of just chaos and that’s because the original signal that you’re putting out there isn’t truly aligned to your highest purpose. To realign your signal, you just need to have the intention to do it. You just need to understand that when anxiety controls your life, the reason why everything’s gone off track is because you’re echoing around in this chaos and really know and understand that you can bringyourself to a place of alignment and that will automatically realign your signal. Now, it’s important to understand that the world that you’re experiencing is this echo of the signals that you’re putting out there so the changes don’t happen instantly. The changes will happen slowly and will take some time to adjust and that’s because as humans, we do have the habit of reacting to the signals or responding to the signals as well. We send and we receive and we react as well. That’s how we continually feed this loop. So, it doesn’t come back as a realigned signal right away but it’s important to just maintain in your head that you’re realigning yoursignal. Now, I just want to say on this point that the idea here isn’t to control the outcome. All you’re doing is aligning your signal, making sure that your signal is 100% grounded and on track with who you are and then you’re putting the signal out there because the idea that you control what’s going on out here, the idea that you control what comes back to you is an absolute illusion. No one has 100% control of anything. We are part of the universe. So, it’s a group effort whether you know it and like it and acknowledge it or not, the idea that you can 100% control an outcome is an absolute illusion. So that brings me to my second point, which is acceptance. When anxiety controls your life, you really need to accept that you can’t control the outcome. The idea of control is an illusion but accept that you are responsible for what you’re putting out there. So, by bringing yourself into alignment and by adjusting your signal and then just fully coming into acceptance and surrender and relax every muscle in your body, every cell in your body in that acceptance that you’re doing enough simply by realigning your signal and putting it out there. Acceptance is the most beautiful and kind thing that you can do for yourself. By coming into acceptance, you relinquish that need for control and you also step into a place of real resilience because you know that no matter what happens, you can respond and you can roll with whatever comes your way. And as I said before, there’s no way that your signal is going to bring back a completely aligned result right away. That’s going to take time. When anxiety controls your life, you’re going to have to work through levels of misaligned signal for a while until your echo comes back nice and clear for you. But just coming into acceptance that you’ve realigned your signal now and that the echo that comes back will be completely aligned in the future, and maintaining your faith that that’s how it’s going to be, is just so kind and so wonderful for you. 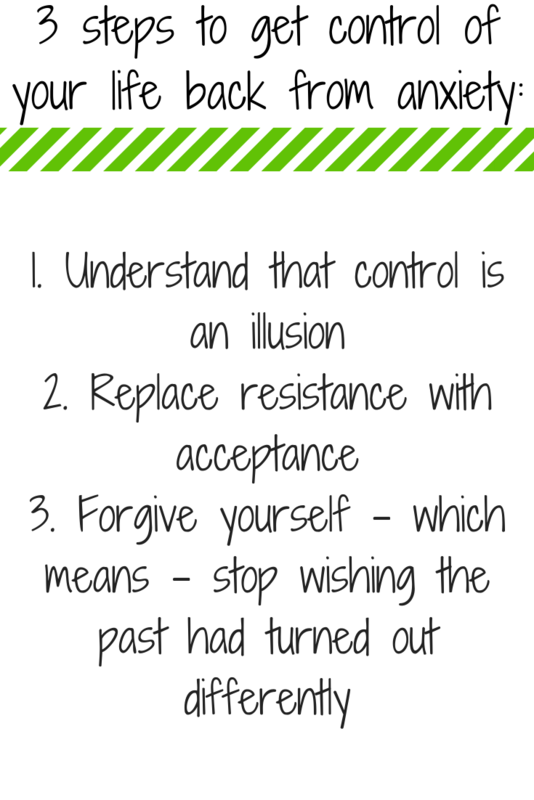 That brings me to step three because acceptance is really self-forgiving as well. Forgiveness is the third step and it is absolutely beautiful. What I mean by forgiveness, is stop wishing that things had turned out differently in the past. Stop wishing that you can go back in time and change things. What happened in the past happened because it was the result of the misaligned echo. When anxiety controls your life, your signal comes from a place of misalignment so the result you get back is going to come from a place of misalignment. You can’t actually go back in time and change what happened. Now, with reiki energy, I can send reiki back into the past to heal the patterns of what happened there that the result is in the present, is right now. So, I can go back in time, I can remove blockages from what happened but I can’t actually change what happened in the past. You can’t change what happened in the past either and nor would you ever want to. This is because what happened in the past gave you the growth lessons that you need that bring you here right now. Forgiveness is an amazingly kind and self-loving thing that you can do for yourself when anxiety controls your life. By stopping this wish that you can go back in time and change the past, you bring yourself into the present which is where the power is. To help bring you into a state of alignment, I recommend my free Ho’oponopono meditation. Ho’oponopono is an ancient Polynesian forgiveness and reconciliation ritual. You can download it, listen to it, repeat the mantras which are “I love you, forgive me, I’m sorry, thank you”. By repeating this again and again, you bring your signal into a place of acceptance and forgiveness and you realign your signal. By doing this, you bring yourself into the present, releasing the past and allowing yourself to move forward into a life of peace and happiness.